Feel free to download 2017 Calendar with Bank Holidays templates available in this webpage to keep you all updated about the upcoming bank holidays in a year. 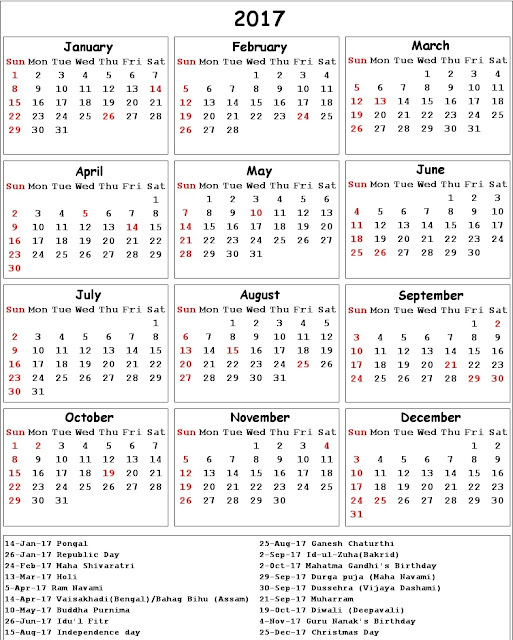 Most of the calendars shared here are free to download and once download a calendar then he/ she can make any changes as per the work requirement. To edit or customize a calendar, download work or excel calendar only, it's pretty simple & easy to alter to its various elements as per individual requirement. A variety of calendars are available which can be used for different purposes, the purpose of holiday calendar is to let the user have a knowledge about the upcoming holidays. 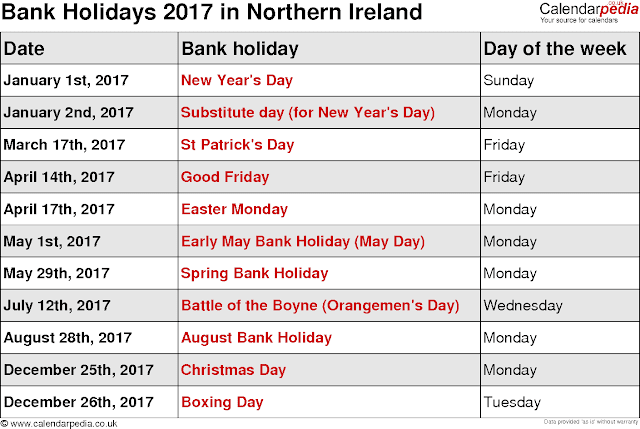 Through this webpage, we're sharing 2017 Bank Holiday Calendar that will tel you about all the upcoming bank holidays. Bank holiday may or may not vary from country to country so make sure to check the calendar as per your country only. 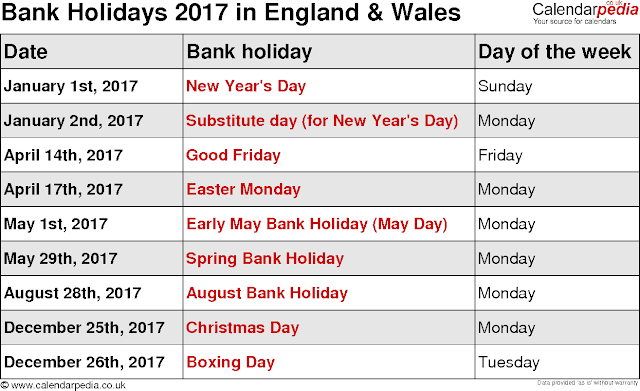 The bank holidays of various countries such as USA, UK, Canada, Australia, India, Northern Ireland, England & wales etc are shared here. More countries will be added here soon. All the calendars are downloadable, all you need to do is click on the calendar to open a full size and then save it in the storage of your computer or laptop. If require, then take a print-out of the calendar by following a normal method. For holidays falling on Sunday, most bank offices will be closed the following Monday. In 2017, New Year's Day (January 1st) falls on Sunday. So following Monday (January 2nd) is holiday. For holidays falling on Saturday, most of the bank branches will be open the preceding Friday. In 2017, Veterans Day (November 11th) falls on Saturday. Why 2017 Calendar with Bank Holidays? A bank is a most important part of human life as for all the money related transactions you need to visit a bank. Nowadays, most of the transactions take place through online mode and there are ATM's to debit cash, but still people need to visit bank for some or other work. There is a proper timing for the opening and closing of bank and there are holidays on which a bank remain closed. So if you're a person who often visit bank for transactions then it is recommended to download a 2017 Calendar with Bank Holidays to know about the date on which the bank remain closed. Government keep on implementing new rules & regulations, so it's necessary to download a bank holiday calendar to keep updated. If you find this post useful then please share with other people as well, the sharing buttons of Facebook, Twitter, Google +, Whats app etc. are provided right below the post. Make sure to check our other posts as well for calendars in various other categories and formats.